Updated for our 20th Birthday in 2017! Where did the "Rotation Model" come from? Like many churches and church educators, over the years I had experimented with rotating kids through various learning activities or "stations" and theme-ing classrooms for special programs, such as VBS. And like everyone else, I concluded that rotating and special set-ups were great, but the level of creativity was unsustainable --especially when you had to change the story each week and do a new setup. In my particular church, we also had the burden of horrible classrooms and teachers who were going through the motions. So in June of 1990, I sat down in front of a flipchart with Melissa Hansche our part-time Christian educator and Julie Ramseyer our children's choir director --and listed all the things we didn't like about our Sunday School. It was a LONG list. The breakthrough moment came when we simply asked, "what if instead of rotating the story every week, we rotated the kids through the story using a different approach each week." That would allow us to spend time in each story doing different creative techniques in different classrooms. That's when I started drawing circles --one for each classroom we had available, and started labeling each classroom with a different teaching method: "Art" and "Drama" and so forth. The final piece of the Model arrived with a similar epiphany in that meeting: "Don't rotate the teachers, only the kids." Let the teachers repeat their special lesson and improve it with each new group every week. Preparation time would go down, and lesson quality would go up, and special decor related to the teaching method and activity could STAY UP for weeks at a time. It all seems obvious now, but at the time, it was kind of scary obvious! ...especially the idea of not having a designated teacher for each grade level, but rather, assigning the teacher to the classroom (workshop) that they wanted to teach in. We wondered if they would like that idea but knew it was worth a try. After they saw how much fun it was to teach that way, they were sold. We've since heard from other educators who've had similar epiphanies. Many were missing the "multiple weeks per story" solution, or still rotating their teachers with their kids. Where did the name "Workshop Rotation Model" come from? Melissa Hansche and I coined the name, but we thought it was awkward. So we simply called it "Sunday School" or "Sunday School Workshops" within our congregation. Where did the concept of "Workshops" come from? Our idea for transforming classrooms into exciting "workshops" came about during our first brainstorming session. We were lamenting our teacher's lack of room decor, and their constant under-utilization of art, videos, and skits in our classrooms, ...even when the curriculum called for it. We recalled our childhood memories of elementary school "art rooms" --and how we wished our Sunday School classrooms were as inviting and exciting. That led us to thinking about designing a standing art workshop. From there, we simply brainstormed several other media-centered rooms. About a year later, we started to read about "multiple-intelligence" and "learning styles," ...which told us why we were on the right track. What's new about the Rotation Model? Primarily, the Rotation Model borrowed from tried and true experiences, mainly: creative teaching styles, teaching in "stations" (workshops), creatively decorating our space, and spending time on stories rather than rushing through them. What was innovative in 1990 was that we figured out how to do all those things EVERY WEEK instead of just for special occasions, and not kill our volunteers in the process. The WoRM made such creative "sustainable." Four months into our Rotation experiment, we added a computer lab. And we introduced some room design ideas that you now see in a lot of Rotation churches. Things like popcorn machines, theater seats, murals, fabric hanging from ceilings and walls, and art stools, permanently decorating our hallways. 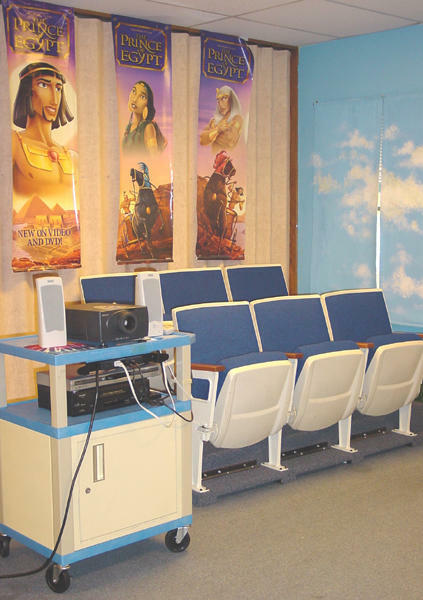 These were things you used to only see in one classroom or for special occasions. We made them a regular feature. We were blessed with rooms that desperately needed help, and members who wanted to help. At first, we were surprised it all worked so well. And then we started to tell some of our CE friends in Chicago, and it started to work well for them too. Palatine Pres in Palatine Illinois was the first to prove our concept wasn't peculiar to us, and several more churches followed in the early 90's. We got together with them from time to time, and that's where the idea of Rotation conferences got started. In the Winter of 1996, the Association of Presbyterian and Reformed Educators came to Chicago and sent a bus-load of participants to our church to learn about the WoRM. That night after the bus-load got back to the conference hotel, they started to tell others about this crazy new model they'd seen in Barrington. The next morning, when Melissa and I arrived at the hotel to do a seminar for those who couldn't make the bus trip, we walked in to over 100 people in the room. It freaked us out. Over those two days in Chicago, dozens of creative educators found the final piece of the puzzle they too had been looking for to revamp their Sunday School. From those two seminars WoRM churches sprang up all over the country. And many of those "first wave" Rotation churches began training churches in their own areas. This is another thing that's new about Rotation: We created a movement of like-minded educators and pastors who reached out to each other without denominational or publishing help. In fact, in it's first decade, many in the publishing establishment were opposed to Rotation (because it competed with their traditional products). How did www.Rotation.org come about? In the Fall of 1996, a network of Rotation churches in Chicago was established under the name "Opening the Doors Network." They led seminars and eventually held a series of national conferences. That same year, I left full-time parish work to pursue my growing passion for teaching with computers in Christian education. I started Sunday Software and began traveling across the country introducing both software and Rotation Model at educator meetings. I must have done a hundred of these before retiring from the seminar circuit in 2004. As I traveled, I had the need to point people to resources, rather than tote them around. So in 1997, I launched www.rotation.org as a way to give away my original Rotation manual and lessons, and collect free lessons given to me by other Rotation pioneers. The manual was later revised and published by the Presbyterian Publishing. I also have to admit, at first rotation.org was merely my attempt to stop the phone calls for help from coming into my office so I could concentrate on developing software. But the site really took off in 2000 when I installed a message board. It allowed people to register, share, and talk to each other. How have the Denominations and Publishers reacted to Rotation? Some not so well. My own denomination viewed it suspiciously, and worried about what it would mean to their curriculum sales. By the late 90's, the Model was spreading faster than anyone could imagine. Local networks began popping up around the country. Articles started appearing in denominational magazines and even local newspapers. Resource centers started talking about it and sponsoring seminars. And there were Rotation curriculums starting to pop up. In the early 2000's, when the denoms and publishers realized Rotation was a true Model and not a fad, the big curriculum publishing arms of the ELCA, PCUSA, UMC, and Group published "rotation-like" curriculum. They were a bit watered-down, but at least they recognized that the traditional model wasn't what everyone wanted. In 2002 it was estimated by one publisher that over 5000 churches were actively using the Rotation Model in the U.S. and Canada. And many more were using ideas and materials generated by the Model and website. That number is now much higher, though nobody really knows. Rotation.org gets about half a million page views a month from all over the world. TIME magazine did a feature on the future of Sunday School in its Dec 16, 2002 issue and called Rotation "one of the most popular innovations in Sunday School." Workshop Rotation is not merely a "model," it is both permission to experiment and change, and a new way to share and resource between creative teachers. In web-terminology, you could call what we do here at Rotation.org, "Crowd Sourcing and Crowd Funding." Sunday School is still in trouble, those these days it has more to do with shrinking demographics than learning models. We drove away several generations of children who eventually left the church as adults and now don't bring their kids to church. Coincidence? I don't think so. Rotation may be a great way to minister to shrinking numbers of children, but there's plenty more that needs changed in the Church. What the WoRM has proved, however, is that change won't come by denominational publishing or wrangling over theology. What your church needs is already out there in someone else's church. Creative problem solving can produce exciting changes and great results. Creative Sunday School models, lessons, and ideas probably aren't going to come from traditional publishers. Teachers need support communities, not just product websites. I started www.Rotation.org in 1997 to give away my Rotation Manual and a few lesson plans. I was on the "seminar circuit" talking about software for Sunday School and introducing people to the Rotation Model. At the end of every seminar, I'd tell people, "Everything you need to get started in Rotation is at rotation.org." In 2002, First Presbyterian Church in Birmingham, Michigan (Cindy Merten's church) gave us a grant to fund a part-time resource coordinator and turn our project into an organization. Anne Camp, my friend and fellow rotater, volunteered her church to manage the funds and pay the bills. (Anne would later join the Board and eventually serve as Treasurer.) I asked my friends Ken and Phyllis Wezeman to be our first coordinators. They were well-known curriculum writers and Rotation enthusiasts. About that time, along came Carol Hulbert, a Rotation Model teacher and writer from Ann Arbor Michigan with a passion for what Rotation.org could become. I first met "CreativeCarol" at a seminar in Ohio and she soon became a regular contributor at the site and part of our leadership team. Along with the Wezemans, and soon to be new Board members Jaymie Derden (prolific lesson writer!) and Julie Burton (our first official treasurer), we laid the groundwork for our incorporation. In 2005, Rotation.org became a registered 501(c)3 non-profit with Carol as our first President. I turned over ownership of the site and the Rotation trademark to the Board, and lurked in the background providing tech support, advice, and content. Ken and Phyllis stayed on as coordinators. We sent out an annual email asking for support, and for several years that modest appeal paid the bills. Sometime around then we "found" Luanne Payne, a Rotation juggernaut in Ontario. She joined the Board and eventually became Board president in 2012. In 2008, I rotated off the Board and began offering tech and content help from afar. The site kept growing thanks to some great lesson contributions and the hard work of many. 2010 would prove to be a pivotal year for Rotation.org. At the Board's request, I installed the "premium supporting members" module so the site could generate a budget and solve the organization's growing financial needs. Our Supporting Members literally made Rotation.org possible, and their donations freed our leadership to focus on expanding and improving content. In 2012, I was hired by the Board to undertake a major content renovation of the lesson forums. Working with groups of volunteers for nearly two years, we reviewed, culled, edited, and reorganized every lesson forum. That same year, Cathy Walz, a creative lesson writer and Rotation Sunday School coordinator from Chicago, joined the Board as our "token Lutheran" --the rest of us being boring Methodists and Presbyterians. In 2017, Cathy became our new Treasurer. Late in 2012, while still working on the content improvements, the Board added hours to my part-time status so that I could help them implement a major technical upgrade to the site's community platform. Now in our 15th year, we realized that our organization and content wasn't the only thing that was growing -- the technical requirements were too. In the Spring of 2013, we applied for and won a grant from Google for free "Adwords." Anyone searching for "free Sunday School lessons and curriculum" would now see an ad from us in their search results. This caused traffic to zoom. By the middle of 2013, it was obvious that our technical needs, and content and member management needs had outgrown the capacity of our volunteer and a few hours a week of paid help. In response, the Board created a regular part-time job and hired me to become webmaster and content manager. That's when they started calling me "Wormy." In early 2015, the Board voted to tackle improving the Writing Team's 12 years worth of lessons and began looking to hire someone to revise them (there were too many for a volunteer to do). When they couldn't find anyone, later that year after finishing an interim pastorate position, I agreed to become the Lead Writer for the Writing Team Renovation Project. Almost every Board member took part in the process. Board President Luanne Payne volunteered as the Editor. In late 2015, Amy Crane, a long-time Rotation teacher and one of our original lesson contributors, joined the Board. Heidi Weber, another long-time Rotation educator and lesson writer joined the Board in 2016. Both live in Louisiana, which is the first time we've ever had two Board members from same state, let alone, the South. Also in late 2015, Social Strata, our site software provider, unleashed yet another major site upgrade called "Hoop.la." It made our site 100% responsive (functional) no matter what computer device you were using, but it also made managing and updating our site quite complex, so they increased my webmaster hours. Looking ahead, our site has technical and content needs which the Board and I are committed to addressing. Stay tuned! Moving from founder ⇒ to volunteer ⇒ to paid staff over 15 years was quite an unexpected journey. In 1997 I knew almost nothing about websites, and had no idea of the learning curve ahead. But I can see God's hand preparing me through the next 20 years of web and software development, and Rotation teaching experience to be of service. And I can see God's hand in assembling the Board we have today. They are some of the finest Christian educators and people I have ever met. We are blessed by their commitment and by everyone whose contributions of money and content make this site, and its future --possible. It has been fun to look back, but I'm even more excited about what's ahead. The Board has several projects in the works, and is always looking for those who want to help manage, write, and improve content. I would encourage you to get involved. It has been life-changing for me. Learn more about the Rotation.org Board and who they are! Being passionate about teaching Sunday School in a way that's creative and attractive to kids. Providing a site where people can freely share creative lesson resources and find personal support. Maintaining our independence from the Christian publishing world and its marketing practices. Continuing to explore the tools and potential of being an online resource community -- without being afraid of the technical challenges.